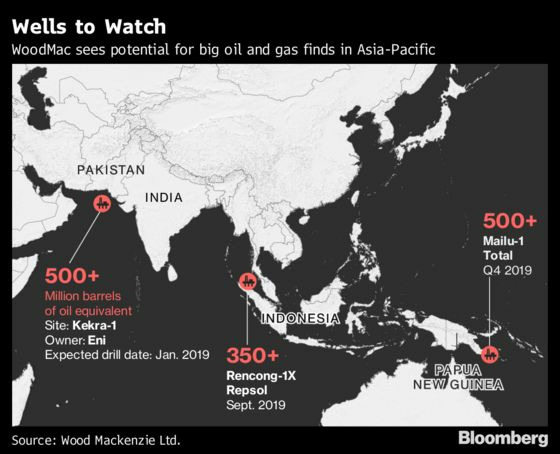 (Bloomberg) -- After a few fallow years, oil and gas drillers may be poised to unearth new reserves in the Asia-Pacific, according to energy consultant Wood Mackenzie Ltd. Some of the world’s biggest explorers are drilling wildcat wells in places like Pakistan, Indonesia and Papua New Guinea this year, hoping to discover the massive deepwater finds that have largely been missing from the region since firms slashed spending following the 2014 oil price crash. Repsol SA could start drilling its Rencong-1X well north of the coast of Sumatra in the third quarter. The Spanish firm is seeking partners to invest and defray risks, Harwood said. Indonesia has leased out several blocks around Rencong, so a find could spur a ripple of activity. It’s also near the Arun LNG terminal, one of the world’s earliest liquefaction plants and now an import terminal to serve Aceh and Sumatra. Total SA could spud the Mailu-1 well in ultra-deep waters south of Papua New Guinea late this year. The French major is looking for oil, Harwood says, but even if it turns out to be gas it could be tied into LNG export infrastructure that the company is already planning to build in the country.